The Zambia Field Station (hereinafter Zambia FS) has been carrying out activities for network research on the problems common to the Southern African countries, under the theme of "Socio-Economic Fluctuations and Changes in the Environment and Communities in Southern Africa." The current research target countries are Zambia, Botswana, Namibia, Zimbabwe, Malawi and South Africa. In FY2004, a total of five ASAFAS faculty members and graduate students were dispatched. In addition, for five months from November to March, Dr. E. Murenga, Deputy Director of the Institute of Economic and Social Research, University of Zambia, stayed in Japan as an ASAFAS visiting researcher, and a few seminars and workshops were held during his stay. Concrete action plans were prepared for the workshops scheduled in FY2005 and 2006 in Japan and overseas (Lusaka, Zambia). 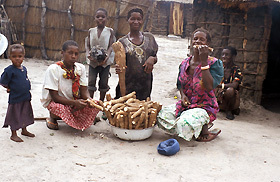 From April 1 to August 4, 2004, MURAO Rumiko (enrolled in FY2000), conducted a field survey in Zambia on the livelihoods of the people living in the Kalahari sands that stretch out in Southern Africa. She has revealed how the people who fled from the conflicts in Angola and settled in a village of Senanga District, Western Province, Zambia have reorganized their livelihoods in a new natural and social environment in consideration of the changes in the political and economic background and the resulting changes in farmland use at the time of the resettlement. Information on macro changes in the political and economic background was gathered in the university library and the central bureau of statistics, while micro information was gathered by interviewing villagers. Changes in farmland use were surveyed by measuring the land using GPS, along with information on distribution, inheritance and disposition. Cassava growing, the core livelihood activity, was also surveyed. Harvested cassava (30 kg in total). After harvesting, the cassava is immersed in water for fermentation, and then dried. This volume can support a family of five for two days as a staple food. In the survey village, where vegetation changes caused by bush encroachment are a problem, the land nearby the cattle grazing camp, which was established in a sparsely-populated remote site, plays an important role in the utilization of tree resources and plant and animal resources as food. Most of the families, which have no cattle grazing camps, avail themselves of the opportunity to use the resources given to them as a gift by the camp-owner families. The relationship among the families living nearby is considered so vital that is expressed as "like the bones of the neck," and various natural resources are presented as gifts among them. Fruit trees that are considered precious have also been subjected to logging in recent years. Ovambo making fruit wine. 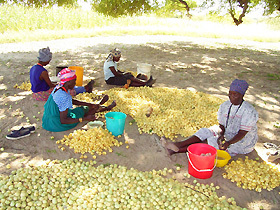 During the rainy season, when the marula fruits ripen, Ovambo women busily prepare the fruit wine. From November 11 to December 3, 2004, ARAKI Shigeru (ASAFAS faculty member) carried out development and improvement of the field station (see the section "Activities of the Field Station"), provided guidance to graduate students for on-site research, and conducted fieldwork in Zambia and Zimbabwe. In the Mpika District of Northern Region, Zambia, he conducted a field survey on the settlement in the TAZARA corridor agricultural development project area, and provided supervision to NARISAWA Noriko (enrolled in FY2004) and to AWAJI Kazue (enrolled in FY2004) in the Chamba Valley, Lusaka and in Siavonga District, Central Zambia, respectively to supervise their on-site research. AWAJI Kazue with villagers in front of their home, Siavonga District, Central Zambia. In the Masvingo Province in Southern Zimbabwe, he carried out an investigation on land use both in commercial areas owned by white people and in traditional communal land. He found that in this Province, which was always sparsely populated, massive re-allocation of indigenous people due to occupation of white people did not take place as seen in the northern highlands, and that in communal lands, a land shortage was emerging due to the increase in the population of Shona people, which in turn triggered an influx of black people into commercial areas. MIZUNO Kazuharu (ASAFAS faculty member) visited Namibia from November 17 to December 5, 2004 to grasp the research progress of YOSHIDA Mifuyu (enrolled in FY2004), ASAFAS graduate student. In Windhoek, he visited the Desert Research Foundation of Namibia, where he exchanged information on environmental changes in the semi-arid land, also communicating about his research. He visited Puros in Kaokoland, where he observed the level of woodland destruction by elephants and its influence, and surveyed the environment and human activities surrounding the elephants. As both the number of elephants in Puros and the village population have increased in recent years, he examined the causes and effects of those increases. In Puros, he held a seminar with FUJIOKA Yuichiro and YOSHIDA Mifuyu, and discussed the relationship among vegetation, animals and human activities. He also provided supervision to YOSHIDA Mifuyu for her preliminary doctoral dissertation. 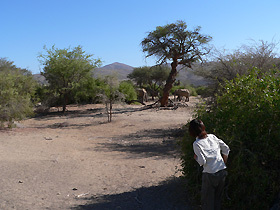 YOSHIDA Mifuyu investigates the ecology and natural environment of elephants in Puros, Kaokoland, Namibia. From February 20 to March 14, 2005, TAKADA Akira (ASAFAS faculty member) undertook the following activities in the Republic of Botswana and Republic of Namibia to develop a research base and establish a research system. In Botswana, he visited people involved in the Collaborative Programme for San/Basarwa Research and Capacity Building of the University of Botswana, where he was briefed about the activities related to program contents and held consultations on mutual exchanges through future researches. In the Republic of Namibia, he exchanged information with researchers of Namibia University, the University of Heidelberg and the University of Manchester regarding ethnographical research in Northern Namibia. He also visited the survey field of FUJIOKA Yuichiro, an ASAFAS graduate student engaged in research in Botswana, and discussed his future research direction. He gathered materials on San community organizations at Namibia University, and on the historical relationship between the San and missionaries in the archives of the Namibia Evangelical Lutheran Church in Northern Namibia (Onipa), and also conducted an investigation into the San development project in Ekoka Village in Northern Namibia. UNESCO is implementing a project to give support and training for the early development of children in a San community in the Ohanguena region. 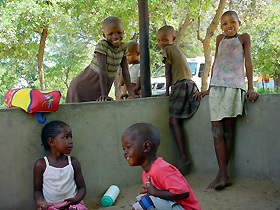 Ovambo children (front) and San children (back) visit the base of the project. The computer installed at the residence of a Japanese staff member of the Japanese Embassy in Zambia is effectively functioning as a tool for communicating with Japan via e-mail and for information gathering. A participatory database using GIS is under construction, and researchers on Southern Africa are accumulating data as necessary. During this fiscal year, a basic graphical map of Zambia, digital elevation data and Landsat images, etc., were installed. The Zambia FS has plans to hold an international workshop in the summer of FY2006 in Lusaka under the sponsorship of the 2lst Century COE Program. Its objective is to share the findings of research in Southern African countries (Zambia, Namibia, Botswana, Malawi and Zimbabwe), where the achievements of on-site research has accumulated, and to strengthen the research network among those countries. As a preparatory step, at the end of FY2005, a domestic workshop is to be held in Tokyo to broadly publicize research achievements and to clarify the issues. The common theme of the planned workshop is "Thinking of the ‘Land' in Southern Africa: From the Viewpoint of Nature, Livelihood and Land Systems," and the integration of humanities and science will be pursued based on each of the themes presented. The preparation and organization of the workshop is being handled by the "Southern African Area Study Group," composed chiefly of graduate students. The Southern African Area Study Group was launched at the initiative of graduate students on the occasion of the establishment of the Zambia FS under the 21st Century COE Program. At the first meeting, held in May 2003, graduate students to be dispatched under the 21st Century COE Program as well as other students and faculty members specializing in Southern Africa took part, and momentum was created to re-position their own research within the framework of "Southern Africa." A proposal was made to formulate a platform to facilitate deeper discussion along with information exchanges on Southern Africa, and the first study meeting was held in September 2003. Araki, Shimada, Mizuno, Takada, Akiyama, Nakayama, Okamoto, Maruyama, Murao, Fujioka, Miyashita, Uno, Ito, Iida, Yoshikawa, Nakayama, Yoshida, Narisawa, Awaji,, Murenga and other researchers from in and outside Kyoto University participated as necessary. 1st meeting: September 17, 2003, 15:00 -, at the seminar room on the 5th fl. of the New bldg. Murao Rumiko made a presentation on her field research plan from November. 2nd meeting: July 22, 2004, 15:00 -, at the seminar room on the 5th fl. of the New bldg. Yoshida, Awaji, Narusawa and Fujioka made presentations about their respective research interests and research plans. 3rd meeting: September 24, 16:00 -, at the seminar room on the 5th fl. of the New bldg. Murao Rumiko presented her research report and future direction of her research. 4th meeting: December 17, 2004, 16:00 -, at the seminar room on the 5th fl. of the Newbldg. Yamamoto Kyuta (Department of Social Anthropology, University of Cape Town), made a presentation on the subject of "Alienation and Re-Incorporation: From the Observation of a Street Youth Rehabilitation Program in Cape Town." The presenter, based on interviews heconducted with a male enrolled in the rehabilitation program targeted at street youth (street people between the age 16 and 25) as well as a staff member managing the rehabilitation program, discussed the process through which street youth are alienated from society and re-integrated again through the rehabilitation program. Araki Shigeru, speaking on the subject of "What Characterizes Southern Africa: Findings of Street Observations," introduced various elements commonly observed in rural and urban communities in Namibia, Zambia, Zimbabwe and South Africa (legacies from the colonial days and the developments thereafter).